Ryan at age 3 with his mom looking on….He loves his adjustments….We love him! 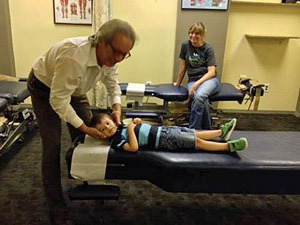 If they are not being treated for a specific problem, or even if they are, I explain that it is never too early to start chiropractic care. Your nervous system controls every cell in your body and chiropractic adjustments are very beneficial to a child. That’s because children are developing rapidly and we want their nervous system to develop optimally. We want their nervous system to be free of nerve interference so that their body runs more efficiently. When children’s bodies run more efficiently, they can experience a boost to their immune system. So when they get exposed to all the different elements in the real world, such as school and other social settings, they can have a better defense system. Having a better defense system means they get sick less often and recover faster if they do get sick. A child’s developing spine can really take a beating through poor posture, carrying heavy backpacks and sports injuries. 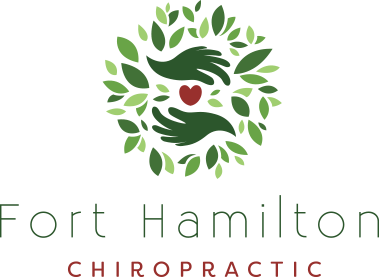 Chiropractic can play a role in helping children have better posture, and experience fewer back injuries and sports injuries such as sprains and strains. So getting back to the title of this article, “Our Office Loves Treating Children,” we love to help children grow and develop healthier from the start. That is a wondrous thing to do. On top of that feeling and to top off that feeling, most children we see LOVE the treatment and we get to experience that joy! Bring your children in so they can be healthy and live life to their fullest potential. Call us today!